New York has passed even stricter gun control legislation, one piece of which bans teachers from carrying any firearm on school grounds. Previously each school district could decide for itself whether to allow teachers or other employees to carry, according to ABC7. 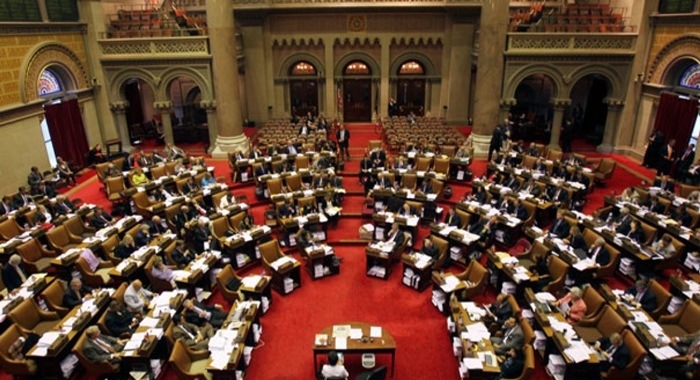 It is the first major gun control legislation passed in New York since Sandy Hook. Here’s a question: have ANY of our mass shooters been an employee or teacher at any school? No. The only people who are actually affected by this are the law abiding ones. But it makes children in New York even less safe. The package of gun control legislation easily made it through the now Democrat controlled chambers. But does it do anything whatsoever to stop mass shootings? No. “It’s a violation of their Second Amendment rights and these are lawful gun owners who are not committing the crimes.” Tom King,president of the New York State Rifle and Pistol Association and a National Rifle Association board member. S.1414/A.763 establishes certain crimes relating to the criminal possession or manufacture of an undetectable firearm, rifle or shotgun. Undetectable guns have been illegal for 30 years. Federal law passed in 1988 makes it unlawful to manufacture, import, sell, ship, deliver, possess, transfer, or receive an undetectable firearm. This legislation essentially bans 3-D printing of firearms. Again, there is zero evidence that criminals are using this expensive and complicated technology to manufacture firearms that are used in the commission of crimes. S.2374/A.2690 extends the waiting period of NICS holds to 30 days. Under current federal law, if a NICS check comes back inconclusive, dealers have three additional days before they can complete the transfer. Someone who happens to have a common name like John Smith, is now forced to wait a full month. This bill will have disastrous and potentially deadly consequences for some, including women who want to purchase a firearm to protect themselves against domestic abusers. S.2448/A.2684 prohibits the possession, manufacture, transport and disposition of “rapid-fire” modification devices. This bill is poorly written and would ban a variety of legal firearm accessories, including many competition or aftermarket triggers. It is also completely redundant and unnecessary as many of the covered accessories are already illegal under federal and state law. Again, this is nothing more than political pandering and will do nothing to enhance public safety. S.2450/A.2686 relates to requirements for the safe storage of rifles, shotguns and firearms. This mandatory storage law would do nothing more than render firearms useless in self-defense situations. Criminals love this bill as it tips the scales in their favor in self-defense situations. S.2451/A.2689 establishes extreme risk protection orders as a court-issued order of protection prohibiting a person from purchasing, possessing or attempting to purchase or possess a firearm, rifle or shotgun. NRA opposes this legislation because it does not contain strong due process protections for respondents who could potentially lose the Second Amendment rights. This legislation is perhaps one of the more dangerous in the package as it would become a widely used instrument to take away someone’s constitutional rights with little or no due process.